Traditional potato Piroshki with caramelized onion and fresh dill are authentic Russian food that is still celebrated the most.Its a hand pie out of fluffy soft dough and potato,caramelized onion, and dill filling. 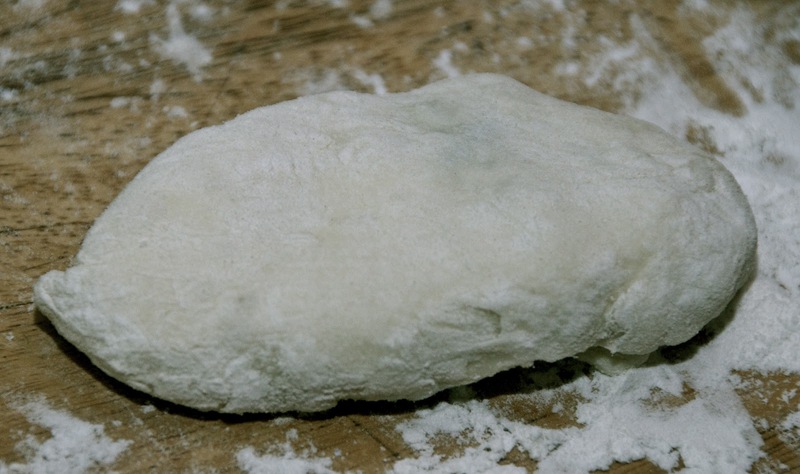 This soft and fluffy dough recipe for piroshki comes from my mom. When making food like piroshki,pelmeni,manti or vareniki, we like to get together with mom and sisters at her house and make them together and just talk and drink some tea or coffee. The time runs much faster especially with pelmeni and vareniki and it brings so much childhood memories when we always used to make them with mom when growing up. In a medium bowl whisk together 1 cup warm milk,1/4 teaspoon salt,sugar,yeast, and 8 tablespoons flour. Cover and set a side for about 10 minutes.It should rise and be foamy. While it’s rising, In a large mixing bowl whisk or use a hand mixer to mix 1 cup warm milk,sour cream, oil, eggs,salt. Add 2 1/2 cups flour and mix/whisk. 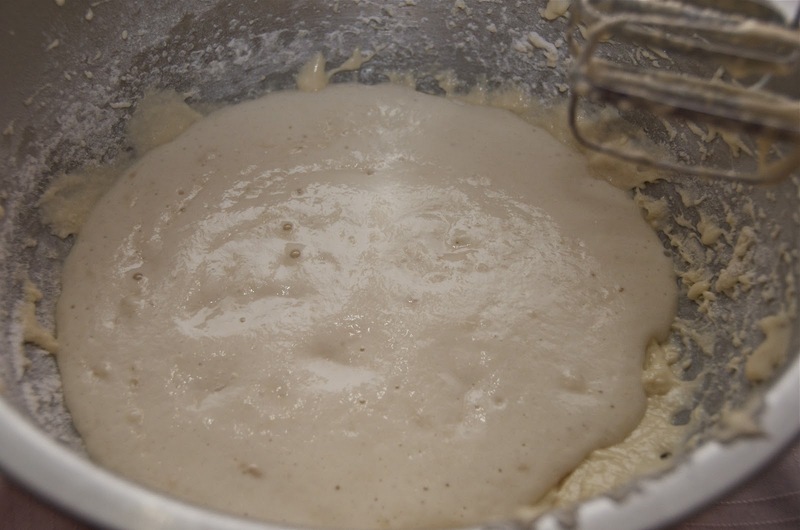 Add the foamy yeast mixture. Mix/whisk and add the rest of the flour and mix carefully. 1 1/2 cups dry shiitake mushrooms soaked in boiling water,drained and cut in pieces. Heat a saute pan on med-high heat. Add olive oil and butter. When butter melts add onions. Saute onions until they will have a caramel color. Add mushrooms and cook for another 5 minutes stirring occasionally. * Omit mushrooms if you don’t like them. Note: The dough will be sticky, I like to apply oil on my hands so the dough won’t stick to them. Cut a piece of dough in size of tennis ball and place it on well floured board or surface. Using your fingers stretch the dough a little. Place about 1 1/2-2 tablespoons of filling. Carefully pinch the sides together. Place it on well floured board or baking pan seam side down. Continue with the rest of the dough. Heat a frying pan with lots of oil on med-high heat. Place piroshki seam side down and deep fry piroshki in batches turning them over once. 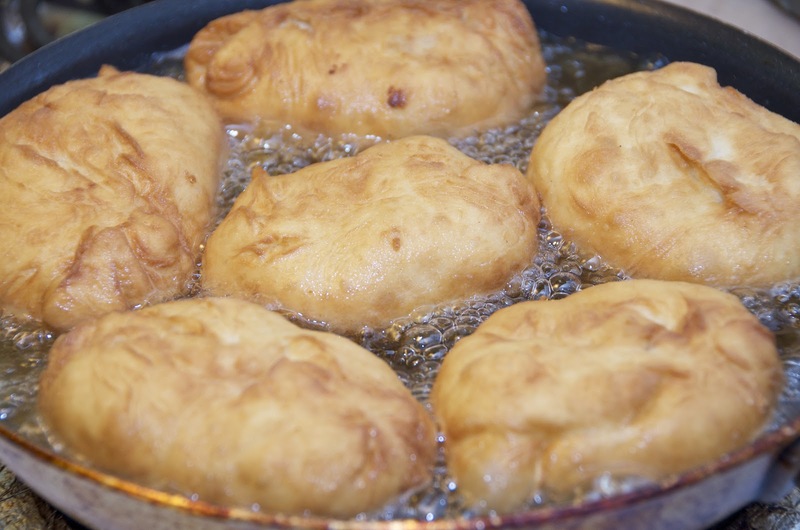 Line a large plate or a bowl with paper towel and place fried piroshki to drain. Melt about 2 tablespoons salted butter with 7-8 crushed garlic. *You can also use olive oil or a combination of both. mix piroshki in a bowl with garlic and butter. I know it’s much more calories but it’s so good! 1.In a medium bowl whisk together 1 cup warm milk,1/4 teaspoon salt,sugar,yeast, and 8 tablespoons flour. 2.Cover and set a side for about 10 minutes.It should rise and be foamy. 3.While it's rising, In a large mixing bowl whisk or use a hand mixer to mix 1 cup warm milk,sour cream, oil, eggs,salt. 4.Add 2 1/2 cups flour and mix/whisk. 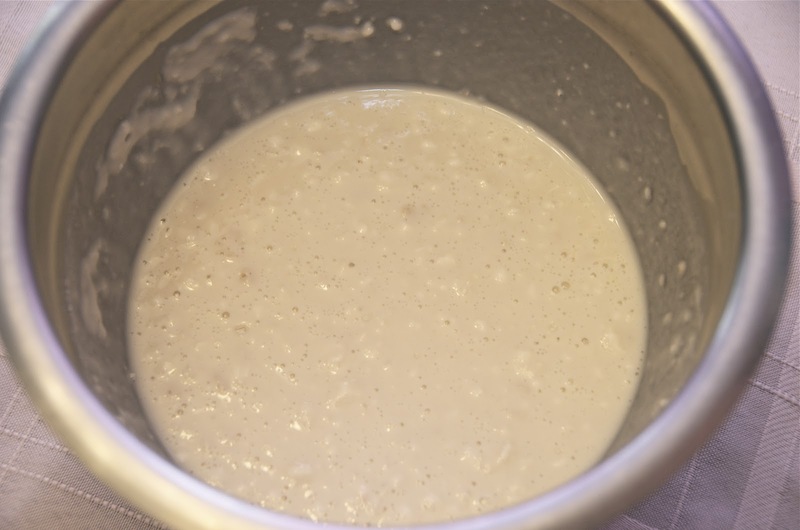 5.Add the foamy yeast mixture. 6.Mix/whisk and add the rest of the flour and mix carefully. 1.Heat a saute pan on med-high heat. 2.Add olive oil and butter. 3.When butter melts add onions. 4.Saute onions until they will have a caramel color. 5.Add mushrooms and cook for another 5 minutes stirring occasionally. 6.Add salt and fresh ground pepper to taste. * Omit mushrooms if you don't like them. Note: The dough will be sticky, I like to apply oil on my hands so the dough won't stick to them. 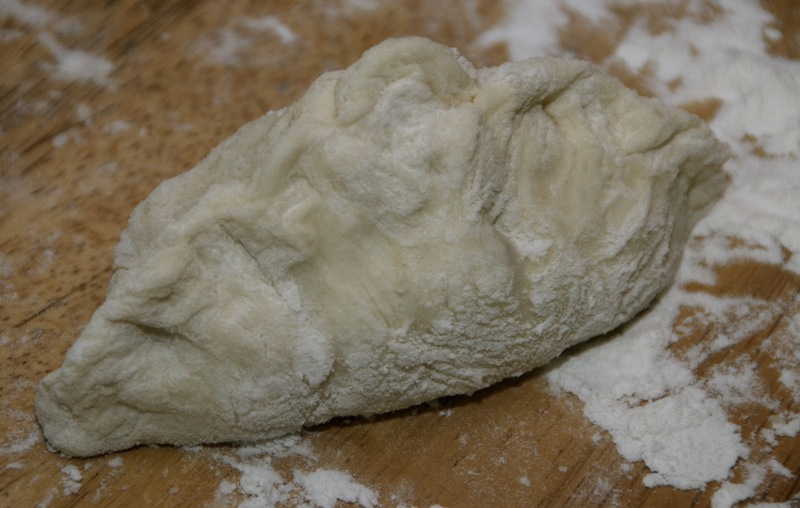 1.Cut a piece of dough in size of tennis ball and place it on well floured board or surface. 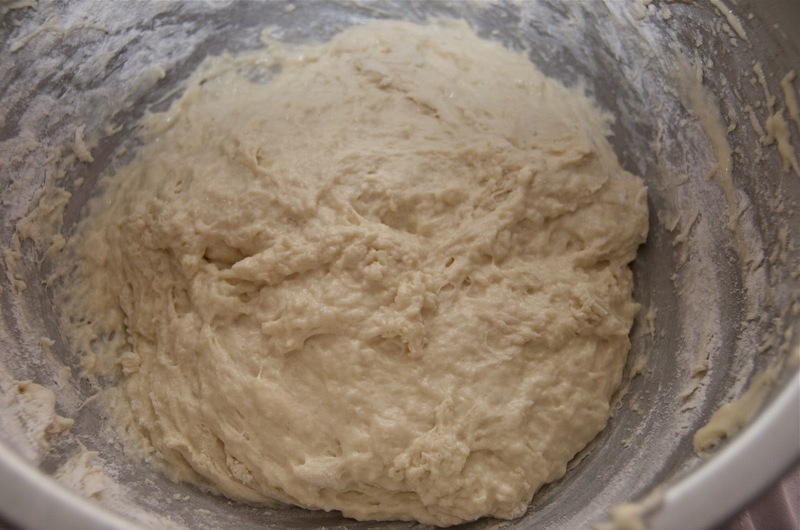 2.Using your fingers stretch the dough a little. 3.Place about 1 1/2-2 tablespoons of filling. 4.Carefully pinch the sides together. 5.Place it on well floured board or baking pan seam side down. Continue with the rest of the dough. 6.Heat a frying pan with lots of oil on med-high heat. 7.Place piroshki seam side down and deep fry piroshki in batches turning them over once. 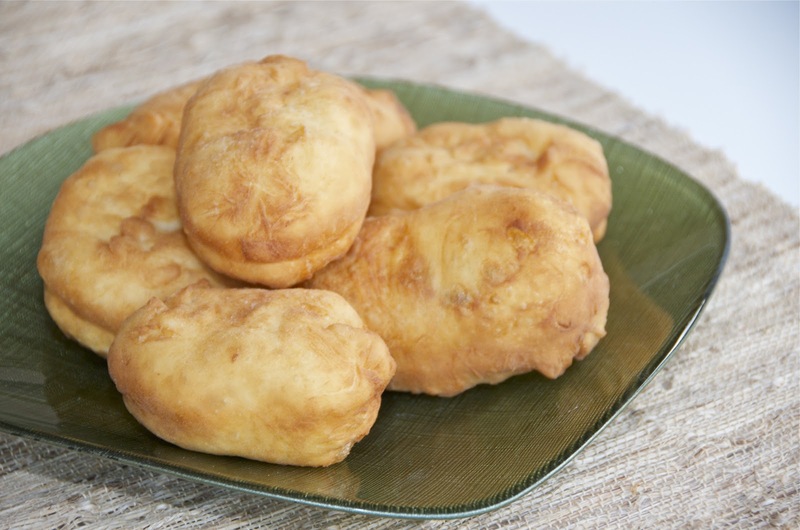 8.Line a large plate or a bowl with paper towel and place fried piroshki to drain. USA; and would love to cook some of these wonderful dishes. Wow,Thats nice. Hope my recipes will be helpful and enjoyable.Thank you! Great post Nadia, I would love to eat a few of them right now. I love cooking with my mom, she is a wealth of knowledge :). Thank you Natasha! same here, especially with dough, they are so good at it and know the best. I have been looking for the dough recipie for years. I used to get the meat piroshki from a lady at a Toronto market. I just loved the flavour and the texture of the dough your mom's look like them.You wouldn't have the meat recipie would you. I think it was ground beef very flavored, the meat seemed very finely ground. Thankyou for the recipie. I have the recipe from my Russian friend & the meat is: fry 1 onion & grated carrot, add beef or beef & pork mince, salt & pepper,sauté till cooked adding one or more stock cube & chopped vermicelli noodles which have been softened in boiling water first. This is the basic recipe, you can add fresh dill if you like. For a different filling you can use sautéed cabbage, chopped hard boiled eggs & sour cream, this is probably my favourite. Hi Sue, You're welcome.I do make it with meat too. I use homemade ground beef and grated onions, with salt and pepper. but I know there is recipes with cooked meat filling. I don't know which one you're looking for. (Cviata Vechera). Your recipe looks good so this year I'm going to try it…thank you for sharing. 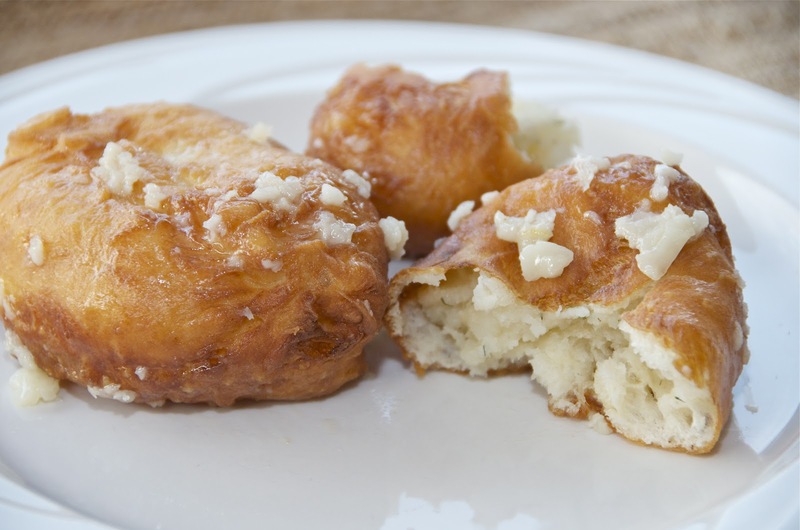 How many piroshky does this recipe make? It really depends how small or big you big you make them. I do mine medium size,so about 20. I am making these with a potatoe, cabbage, onions and bacon filling. I hope it works well. Once assembled, I was wondering if it is possible to freeze them before deep frying to eat at a later time? Hi Francine,I never tried freezing them, but I think it will be fine. Nadia, do you add salt into the yeast mixture or the sour cream mixture? The recipe mentioned to add salt to both. Also, is there a way to bake these? Yes you just 1/4 teaspoon to yeast mixture(mentioned as first part) and the other 1 teaspoon to flour.both parts of the recipe have sour cream. yes you can bake them, but ofcourse they will a little different, kind of crusty.I tried before. Thank you so much for your feedback!Glad you like it. Hello Nadia! Could these piroshki be baked?! If so, what temp. oven would you suggest and for how long? Hello Oksana, they can be baked at 375 degrees for about 20-30 minutes or until golden brown in color. Nadia, have you tried cutting the recipe in half? Do you think the dough would still work if I only made 10 piroshki instead of 20? Hi Oksana, No I didn't try cutting the dough in half.you can try or just put half of the dough in the freezer for later use. 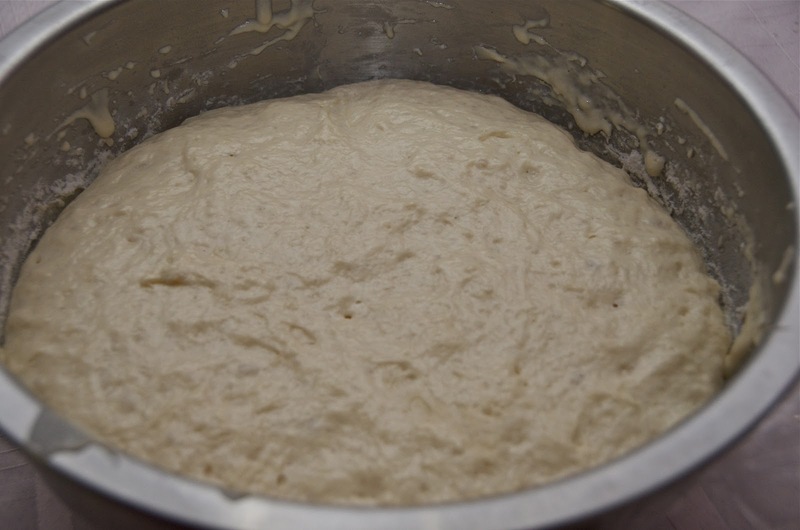 When it’s been floured and ready for frying do you know if its possible to freeze at this stage? If so, when brought out of the freezer can it just be fried without defrosting. Also, what is the shelf life and how do you revive it again after being fried already? yes you can freeze them ,but will need to defrost them. or you can fry first,then freeze them when its cooled.Reheat in microwave or oven.they never last long at our house so don’t really know the shelf life.But I think you can keep them in the fridge 3-5 days easily. is it possible to use kifir to make the Dough as replacement of Milk? Yes you can substitute kefir. Made piroshki first time, loved them, thanks for the recipe!!! Glad you loved them,all time favorite. these are soooo yummy!!!! :))) made them today, came out perfect and delicious! Thank you so much Nadya, for wonderful recipe. 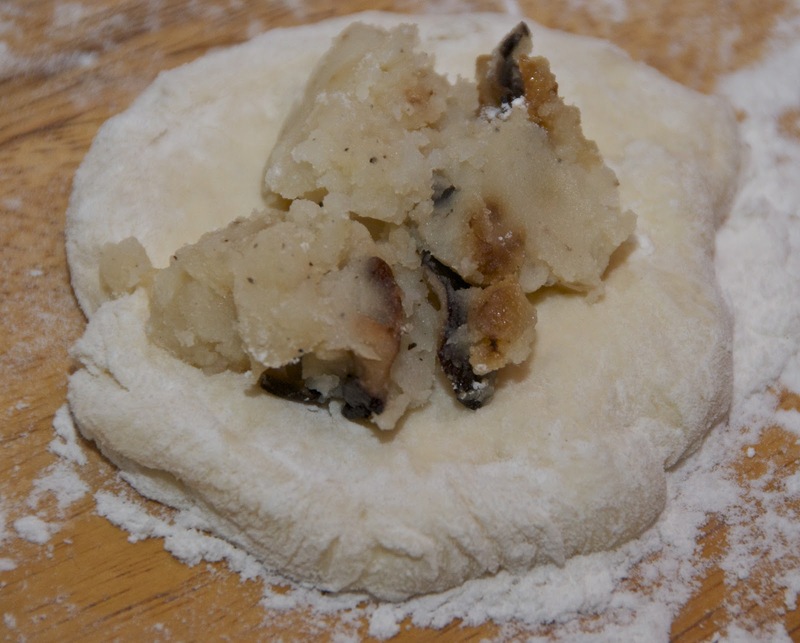 I wanted to learn on how to make piroshki. I tried 2 different recipes from different food blogs and they were kind of hard. This piroshki came out perfect. I messed it up and put 1 1/4 tsp salt into yeast mixture. I realized it almost right away, but it was too late. I was worried how they will turn out, but came out perfect. Can you please tell me why do we need to put salt in two parts? Also, if I wanted to make piroshki with jam, do I need to put more sugar? Thank you. Hi Viktoriya! Thank you so much for your feedback. About salt.. I have no idea.. I need to ask mom,since it’s her recipe. I’m glad it still worked, so I think it’s not a biggie if you add it all to yeast. Were you thinking to fry them with jam or bake? never tried fried with jam.I know sometimes if you add more sugar, the dough is not as soft. I don’t know if the dough will be as soft in this particular recipe( if you add sugar,but you can try). Hi! We are attempting to make piroshki for the 4th grade class at a historical themed field trip. We plan to make ahead and freeze. The only methods of cooking will be over an open fire. 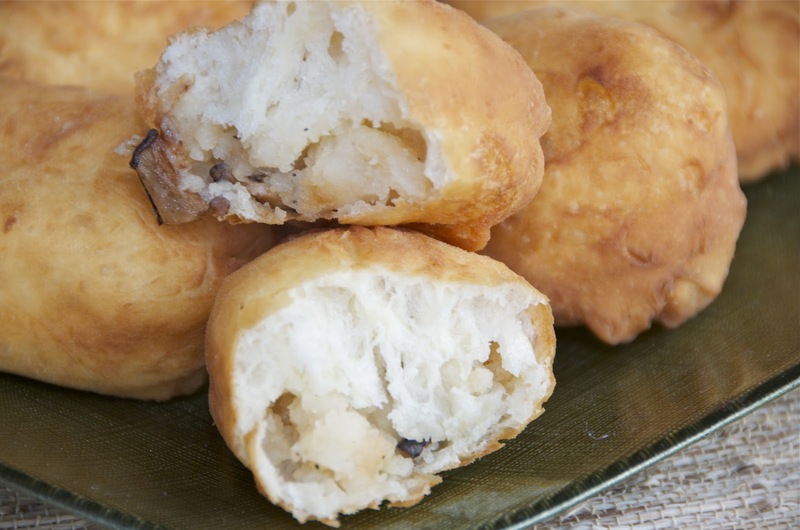 Would you recommend steaming or frying the piroshki? Sorry for late response, best would be frying!